Yesterday, I was at an amazing meeting. The three public lectures about climatology were not that eventful, although it was interesting to see how you can present the main climatological findings in a clear way. The amazing part was the Q&A afterwards. I was already surprised to see that I was one of the youngest ones, but had not anticipated that most of these people were engineers and economists, that is climate ostriches. As far as I remember, not one public question was interesting! All were trivially nonsense, I am sorry to have to write. One of the ostriches showed me some graphs from a book by Fred Singer. Maybe I should go to an economics conference and cite some mercantile theorems of Colbert. I wonder how they would respond. Afterwards I wondered whether translating their "arguments" against climatology to economy would help non-climatologists to see the weakness of the simplistic arguments. This post is a first attempt. #1. That there is and always have been natural variability is not an argument again anthropogenic warming just like the pork cycle does not preclude economic growth. #2. One of our economist ostriches thought that there was no climate change in Germany because one mountain station shows cooling. That is about as stupid as claiming that there is no economic growth because one of your uncles had a decline in his salary. #3. The claim that the temperature did not increase or that it was even cooling in the last century, that it is all a hoax of climatologists (read the evil Phil Jones) can be compared to a claim that the world did not get wealthier in the last century and that all statistics showing otherwise are a government cover-up. In both cases there are so many independent lines of research showing increases. #4. The idea that CO2 is not a greenhouse gas and that increases in CO2 cannot warm the atmosphere is comparable to people claiming that their car does not need energy and that they will not drive less if gasoline becomes more expensive. Okay maybe this is not the best example, most readers will likely claim that gas prices have no influence on them, they have no choice and have to drive, but I would hope that economists know better. 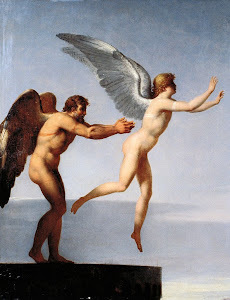 The strength of both effects needs study, but to suggest that there is no effect is beyond reason. #5. Which climate change are you talking about, it stopped in 1998. That would be similar to the claim that since the banking crisis in 2008 markets are no longer efficient. Both arguments ignore the previous increases and deny the existence of variability. #6. The science isn't settled. Both science have foundations that are broadly accepted in the profession (consensus) and problems that are not clear yet and that are a topic of research. #7. The curve fitting exercises without any physics by the ostriches are similar to "technical analyses" of stock ratings. [UPDATE. Found a nice one. Looking at the global average surface temperature (which is what those graphs tend to show), is a bit like looking at someone's bank account. It's a pretty good approximation of how much money they have, but there's going to be a lot of variability, based on not knowing what outstanding bills the person has, and the person is presumably earning income continuously, but only getting paychecks at particular times. This mostly averages out, but there's the risk in looking at any particular moment that it's a really uncharacteristic moment. In particular, it seems to me that the "pause" idea is based on the fact that 1998 was warmer than nearly every year since, while neglecting that 1998 was warmer than 1997 or any previous year by more than 15 years of predicted warming. If this were someone's bank account, we'd guess that it reflected an event like having their home purchase fall through after selling their old home: some huge asset not usually included ended up in their bank account for a certain period before going back to wherever it was. You wouldn't then think the person had stopped saving, just because they hadn't saved up to a level that matches when their house money was in their bank account. You'd say that there was weird accounting in 1998, rather than an incredible gain followed by a mysterious loss. The engineers and economists were wearing suits and the scientists were dressed more casually. Thus it was easy to find each other. One had an interesting challenge, which was at least new to me, he argued that the Fahrenheit scale, which was used a lot in the past is uncertain because it depends on the melting point of brine and the amount of salt put in the brine will vary. One would have to make quite an error with the brine to get rid of global warming, however. Furthermore, everyone would have had to make the same error, because a random errors would average out. And if there were a bias, this would be reduced by homogenization. And almost all of the anthropogenic warming was after the 1950-ies, where this problem no longer existed. A related problem is that the definition of the Fahrenheit scale has changed and also that there are many temperature scales and in old documents it is not always clear which unit was used. Wikipedia lists these scales: Celsius, Delisle, Fahrenheit, Kelvin, Newton, Rankine, Réaumur and Rømer. Such questions are interesting to get the last decimal right, but no reason to become an ostrich. I find it a bit disturbing that so many economists come up with so simple counter "arguments". They basically assume that climatologists are stupid or are conspiring against humanity. Expecting that for anther field of study makes one wonder where they got that expectation from and shines a bad light on economics. This was just a quick post, I would welcome ideas for improvements and additions in the comments. Did I miss any interesting analogies? The first announcement has been published of the 8th Seminar for Homogenization. This is the main meeting of the homogenization community. It was announced on the homogenization distribution list. Anyone working on homogenization is welcome to join this list. This time it will be organized together with the 3rd conference on spatial interpolation techniques in climatology and meteorology. As always it will be held in Budapest, Hungary. It will take place from the 12th to the 16 May 2014. The pre-registration and abstract submission deadline is 30 March 2014. This is part 2 of the series on weather variability. A more extreme climate is often interpreted in terms of weather variability. In the media weather variability and extreme weather are typically even used as synonyms. However, extremes may also change due to changes in the mean state of the atmosphere (Rhines and Huybers, 2013) and it is in general difficult to decipher the true cause. 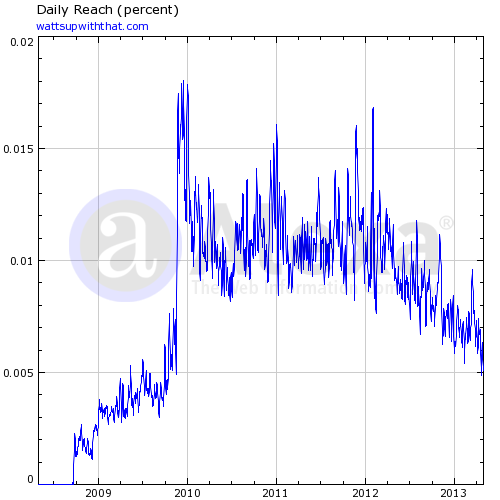 Changes in mean and variability are dislike quantities. Thus comparing them is like comparing apples and oranges. Still Katz and Brown (1992) found one interesting general result: the more extreme the event, the more important a change in the variability is relative to the mean (Figure 1). Thus if there is a change in variability, it is most important for the most extreme events. If the change is small, these extreme events may have to be extremely extreme. "[Changes in the variability of climate] need to be addressed before impact assessments for greenhouse gas-induced climate change can be expected to gain much credibility." 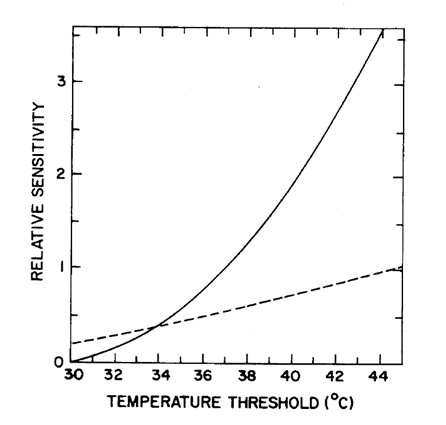 The relative sensitivity of an extreme to changes in the mean (dashed line) and in the standard deviation (solid line) for a certain temperature threshold (x-axis). The relative sensitivity of the mean (standard deviation) is the change in probability of an extreme event to a change in the mean (or standard deviation) divided by its probability. From Katz and Brown (1992). It is common in the climatological literature to also denote events that happen relatively regularly with the term extreme. For example, the 90 and 99 percentiles are often called extremes even if such exceedances will occur a few times a month or year. Following the common parlance, we will denote such distribution descriptions as moderate extremes, to distinguish them from extreme extremes. (Also the terms soft and hard extremes are used.) Based on the theory of Katz and Brown, the rest of this section will be ordered from moderate to extreme extremes. We start with the variance, which is a direct measure of variability and strongly related to the bulk of the distribution. Della-Marta et al. (2007) studied trends in station data over the last century of the daily summer maximum temperature (DSMT). They found that the increase in DSMT variance over Western Europe and central Western Europe is, respectively, responsible for approximately 25% and 40% of the increase in hot days in these regions. They also studied trends in the 90th, 95th and 98th percentiles. For these trends variability was found to be important: If only changes in the mean had been taken into account these estimates would have been between 14 and 60% lower. Also in climate projections for Europe, variability is considered to be important. Fischer and Schär (2009) found in the PRUDENCE dataset (a European downscaling project) that for the coming century the strongest increases in the 95th percentile are in regions where variability increases most (France) and not in regions where the mean warming is largest (Iberian Peninsula). The 2003 heat wave is a clear example of an extreme extreme, where one would thus expect that variability is important. Schär et al. (2004) indeed report that the 2003 heat wave is extremely unlikely given a change in the mean only. They show that a recent increase in variability would be able to explain the heat wave. An alternative explanation could also be that the temperature does not follow the normal distribution. Are break inhomogeneities a random walk or a noise? Tomorrow is the next conference call of the benchmarking and assessment working group (BAWG) of the International Surface Temperature Initiative (ISTI; Thorne et al., 2011). The BAWG will create a dataset to benchmark (validate) homogenization algorithm. It will mimic the real mean temperature data of the ISTI, but will include know inhomogeneities, so that we can assess how well the homogenization algorithms remove them. We are almost finished discussing how the benchmark dataset should be developed, but still need to fix some details. Such as the question: Are break inhomogeneities a random walk or a noise? The benchmark dataset of the ISTI will be global and is also intended to be used to estimate uncertainties in the climate signal due to remaining inhomogeneities. These are the two main improvements over previous validation studies. Williams, Menne, and Thorne (2012) validated the pairwise homogenization algorithm of NOAA on a dataset mimicking the US Historical Climate Network. The paper focusses on how well large-scale biases can be removed. The COST Action HOME has performed a benchmarking of several small networks (5 to 19 stations) realistically mimicking European climate networks (Venema et al., 2012). It main aim was to intercompare homogenization algorithms, the small networks allowed HOME to also test manual homogenization methods. These two studies were blind, in other words the scientists homogenizing the data did not know where the inhomogeneities were. An interesting coincidence is that the people who generated the blind benchmarking data were outsiders at the time: Peter Thorne for NOAA and me for HOME. This probably explains why we both made an error, which we should not repeat in the ISTI. The IPCC has just released a video with main points from the IPCC report on the physical basis. Hat tip Klimazwiebel. It is beautifully made and I did not notice any obvious errors, which you can normally not say for journalistic works, unfortunately. Another nice video by the IPCC is the one on the special report on Extremes (SREX) published last year. Same caveat. 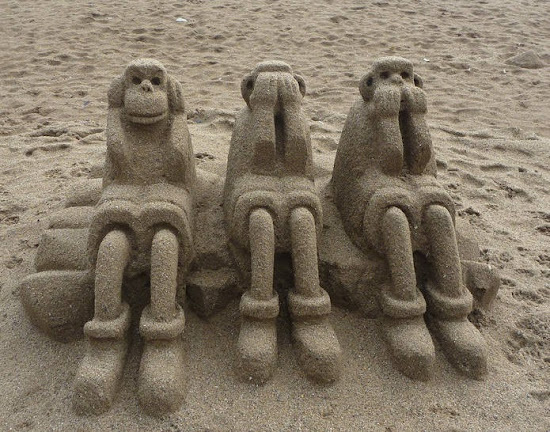 This created quite a splash in the blog-o-sphere; see my last post. This is probably no wonder. 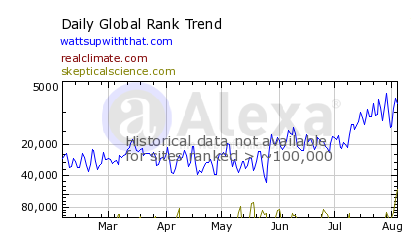 The strange idea that the global warming has stopped is one of the main memes of the climate ostriches and in the USA even of the main stream media. A recent media analysis showed that half of the reporting of the recent publication of the IPCC report pertained this meme. This reporting is in stark contrast to the the IPCC having almost forgotten to write about it as it has little climatological significance. Also after the Cowtan and Way (2013) paper, the global temperature trend between 1880 and now is still about 0.8 degrees per century. The global warming of the entire climate system is continuing without pause in the warming of the oceans. While the oceans are the main absorber of energy in the climate system. The atmospheric temperature increase only accounts for about 2 percent of the total. Because the last 15 years also just account for a short part of the anthropogenic warming period, one can estimate that the discussion is about less than one thousandths of the warming. 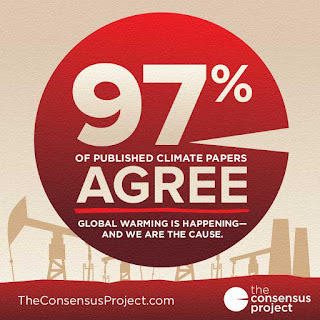 The study was positively received by amongst others the Klimalounge (in German), RealClimate, Skeptical Science, Carbon Brief, QuakeRattled, WottsUpWithThatBlog, OurChangingClimate, Moyhu (Nick Stockes) and Planet 3.0. It is also discussed in the press: Sueddeutsche Zeitung, TAZ, Spiegel Online (three leading newspapers in Germany, in German), The Independent (4 articles), Mother Jones, Hürriyet (a large newspaper in Turkey) and Science Daily. 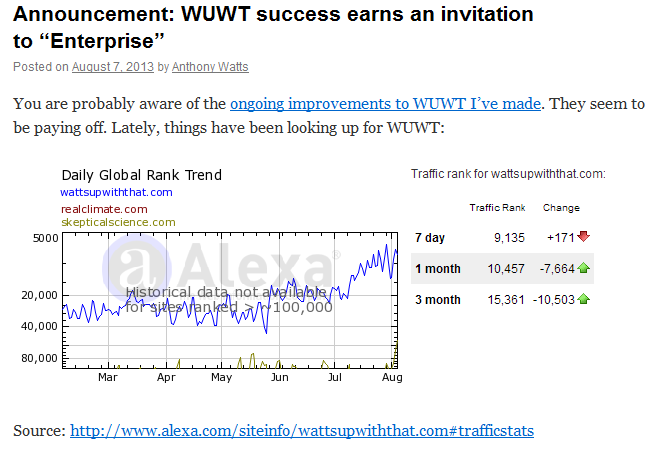 Lucia at The Blackboard wrote in her first post Cotwan and Way: Have they killed the pause? and stated: "Right now, I’m mostly liking the paper. The issues I note above are questions, but they do do quite a bit of checking". And Lucia wrote in her second post: "The paper is solid." Furthermore, Steve Mosher writes: "I know robert [Way] does first rate work because we’ve been comparing notes and methods and code for well over a year. At one point we spent about 3 months looking at labrador data from enviroment canada and BEST. ... Of course, folks should double and triple check, but he’s pretty damn solid." The main serious critical voice seems to be Judith Curry at Climate Etc. Her comments have been taken up by numerous climate ostrich blogs. This post discusses Curry's comments, which were also taken up by Lucia. And I will also include some erroneous additions by Antony Watts. And it will discuss one one additional point raised by Lucia. UPDATED: Now with my response to Juddith Curry's comments and an interesting comment by Peter Thorne. Yesterday a study appeared in the Quarterly Journal of the Royal Meteorological Society that suggests that the temperature trend over the last 15 years is about twice a large as previously thought. This study [UPDATE: Now Open Access] is by Kevin Cowtan and Robert G. Way and is called: "Coverage bias in the HadCRUT4 temperature series and its impact on recent temperature trends". The reason for the bias is that in the HadCRUT dataset, there is a gap in the Arctic and the study shows that it is likely that there was strong warming in this missing data region (h/t Stefan Rahmstorf at Klimalounge in German; the comments and answers by Rahmstorf there are also interesting and refreshingly civilized; might be worth reading the "translation"). In the HadCRUT4 dataset the temperature trend over the period 1997-2012 is only 0.05°C per decade. After filling the gap in the Arctic, the trend is 0.12 °C per decade. The study starts with the observation that over the period 1997 to 2012 "GISTEMP, UAH and NCEP/NCAR [which have (nearly) complete global coverage and no large gap at the Arctic, VV] all show faster warming in the Arctic than over the planet as a whole, and GISTEMP and NCEP/NCAR also show faster warming in the Antarctic. Both of these regions are largely missing in the HadCRUT4 data. 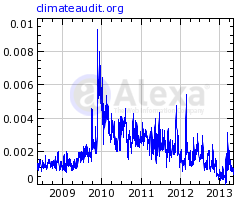 If the other datasets are right, this should lead to a cool bias due to coverage in the HadCRUT4 temperature series.". All datasets have their own strengths and weaknesses. The nice thing about this paper is how they combine the datasets and use the strengths and mitigate their weaknesses. Surface data. Direct (in-situ) measurements of temperature (used in HadCRU and GISTEMP) are very important. Because they lend themselves well to homogenization, station data is temporal consistent and its trend are thus most reliable. Problems are that most observations were not performed with climate change in mind and the spatial gaps that are so important for this study. Satellite data. Satellites perform indirect measurements of the temperature (UAH and RSS). Their main strengths are the global coverage and spatial detail. A problem for satellite datasets are that the computation of physical parameters (retrievals) needs simplified assumptions and that other (partially unknown) factors can influence the result. The temperature retrieval needs information on the surface, which is especially important in the Arctic. Another satellite temperature dataset by RSS therefore omits the Arctic from their dataset. UAH is also expected to have biases in the Arctic, but does provide data. Has COST HOME (2007-2011) passed without true impact on practical homogenisation? Guest post by Peter Domonkos, one of the leading figures in the homogenization of climate data and developer of the homogenization method ACMANT, which is probably the most accurate method currently available. A recent investigation done in the Centre of Climate Change of University Rovira i Virgili (Spain) showed that the ratio of the practical use of HOME-recommended monthly homogenisation methods is very low, namely it is only 8.4% in the studies published or accepted for publication in 6 leading climatic journals in the first half of 2013. The six journals examined are the Bulletin of the American Meteorological Society, Climate of the Past, Climatic Change, International Journal of Climatology, Journal of Climate and Theoretical and Applied Climatology. 74 studies were found in which one or more statistical homogenisation methods were applied for monthly temperature or precipitation datasets, the total number of homogenisation exercises in them is 119. A large variety of homogenisation methods was applied: 34 different methods have been used, even without making distinction among different methods labelled by the same name (as it is the case with the procedures of SNHT and RHTest). HOME-recommended methods were applied only in 10 cases (8.4%) and the use of objective or semi-objective multiple break methods was even much rare, 3.4% only. In the international blind test experiments of HOME, the participating multiple break methods produced the highest efficiency in terms of the residual RMSE and trend bias of homogenised time series. (Note that only methods that detect and correct directly the structures of multiple breaks are considered multiple break methods.) The success of multiple break methods was predictable, since their mathematical structures are more appropriate for treating the multiple break problem than the hierarchic organisation of single break detection and correction. The Data Management Workshop (DMW) had four main themes: data rescue, homogenization, quality control and data products. Homogenization was clearly the most important topic with about half of the presentations and was also the main reason I was there. Please find below the highlights I expect to be more interesting. In retrospect this post has quite a focus on organizational matters, mainly because this was most new to me. The DMW is different from the Budapest homogenization workshops in that it focused more on best practices at weather services and Budapest more on the science and the development of homogenization methods. One idea from the workshop is that it may be worthwhile to have a counterpart to the homogenization workshop in the field of quality control. BREAKING NEWS: Tamas Szentimrey announced that the 8th Homogenization seminar will be organized together with 3rd interpolation seminar in Budapest on 12-16 May 2014. UPDATE: The slides of many presentations can now be downloaded. This week I will be at the Data Management Workshop (DMW) in San Lorenzo de El Escorial. Three fun filled days about data rescue, homogenization, quality control and data products (database). While it is nice weather outside. It is organized by EUMETNET, a network of 30 European National Meteorological Services. Thus I will be one of the few from a university, as is typical for homogenization. It is a topic of high interest to the weather services. Most European experts will be there. The last meeting I was at was great. The program looks good. I am looking forward to it. My contribution to the workshop will be to present a joint review of what we know about inhomogeneities in daily data. Much of this information stems from parallel measurements, in other words from simultaneous measurements with a modern and a historical set-up. We need to know about non-climatic changes in extremes and weather variability, to be able to assess the climatic changes. The coming time, I hope to be able to blog about some of the topics of this review. It shows that the homogenization of daily data is a real challenge and that we need much more data from parallel measurements to study the non-climatic changes in the probability distribution of daily datasets. Please find our abstract below. The slides of the presentation can be downloaded here. Dana Nuccitelli recently wrote an article for the Guardian and the introduction read: "The slowed warming is limited to surface temperatures, two percent of overall global warming, and is only temporary". As I have been arguing before, how minute the recent deviation of the predicted warming is, my first response was, good that someone finally computed how small. However, Dana Nuccitelli followed the line of argumentation of Wotts and argued that the atmosphere is just a small part of the climate system and that you do see the warming continue in the rest, mainly in the oceans. He thus rightly sees focusing on the surface temperatures only as a form of cherry picking. More on that below. There is another two percent. 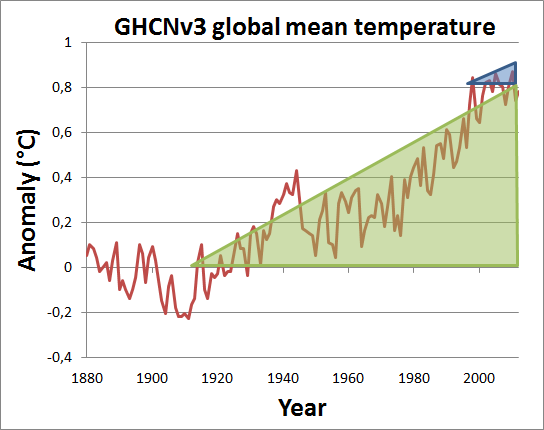 Just look at the graph below of the global mean temperature since increases in greenhouse gasses became important. 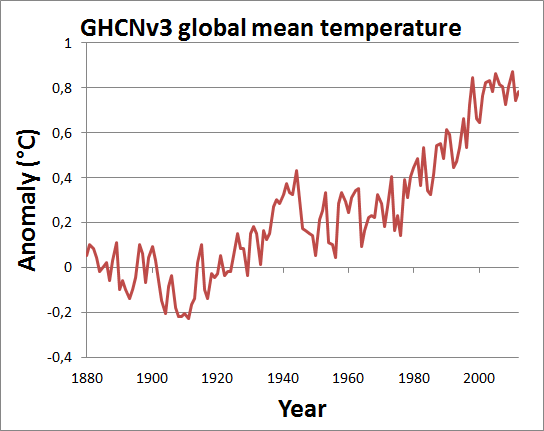 The anomalies of the global mean temperature of the Global Historical Climate Network dataset versions 3 (GHCNv3) of NOAA. 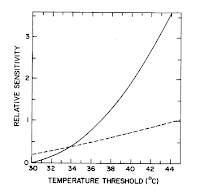 The anomalies are computed of the temperature by subtracting the mean temperature from 1880 to 1899. The temperature increase we have seen since the beginning of 1900 is about 31 degree years (the sum of the anomalies over all years). You can easily compute that this is about right because the triangle below the temperature curve, with a horizontal base of about 100 years and a vertical size (temperature increase) of about 0.8°C: 0.5*100*0.8=40 degree years; the large green triangle in the figure below. For the modest aims of this post 31 and 40 degree years are both fine values. The hiatus, the temperature deviation the climate ostriches are getting crazy about, has lasted at best 15 years and has a size of about 0.1°C. Thus using the same triangular approach we can compute that this is 0.5*15*0.1=0.75 degree years; this is the small blue triangle in the figure below. 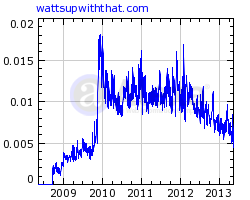 The atmospheric warming hiatus is thus only 100% * 0.75 / 31 = 2.4% of the total warming since 1900. This is naturally just a coarse estimate of the order of magnitude of the effect, almost any value below 5% would be achievable with other reasonable assumptions. I admit having tried a few combinations before getting the nice matching value for the title.